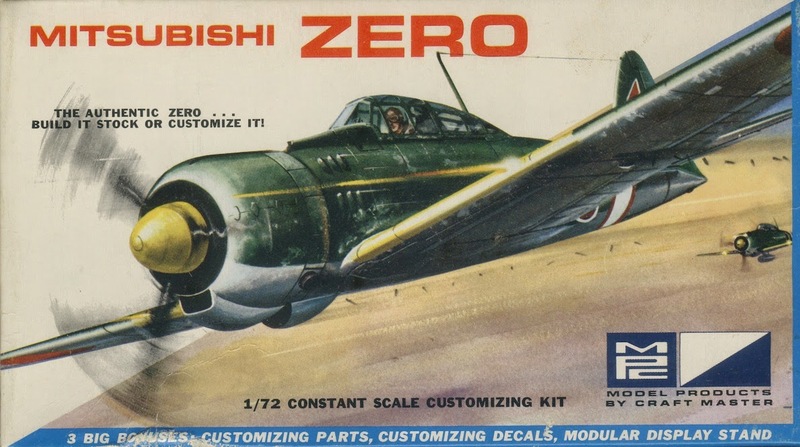 Revell's Zero was marketed in 1963 as kit # H-617, one of the first models in their 'Famous Plane' or 'Warbird' series of constant 1/72nd scale kits with box art by Jack Leynnwood. 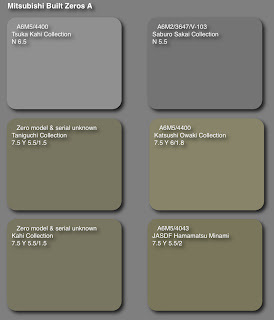 The other 1/72nd scale kits were the 'Memphis Belle' B-17F, Hawker Hurricane and Focke-Wulf 190. 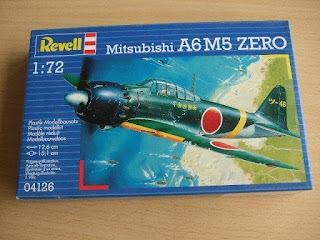 Although not identified as such in the first edition the Revell Zero was meant to represent an A6M5c, but the simple kit was devoid of any wing armament and had a pinched, tapering cowling similar to the Frog kit. 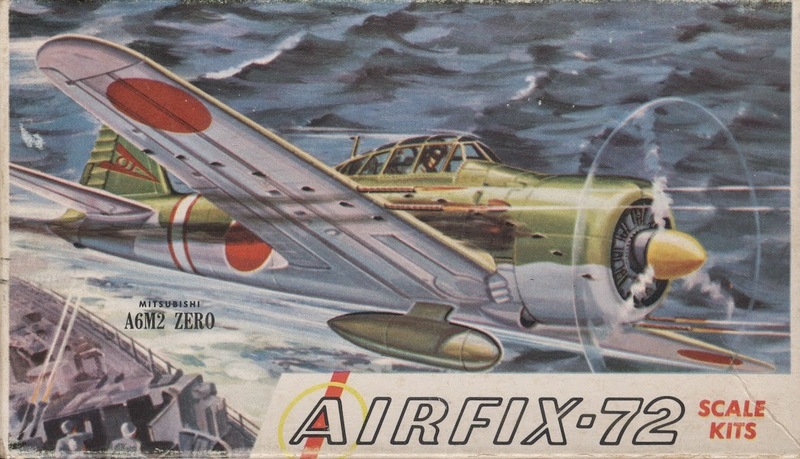 Later editions in a slightly larger box with the same box art had a projecting gun barrel moulded to each upper wing and identified it either as 'A6M56' or 'A6M5C'. Other issues were the central canopy being too tall and the wings too narrow in chord. The kit had none of the later series refinements, such as removable engine panels or an opening canopy. 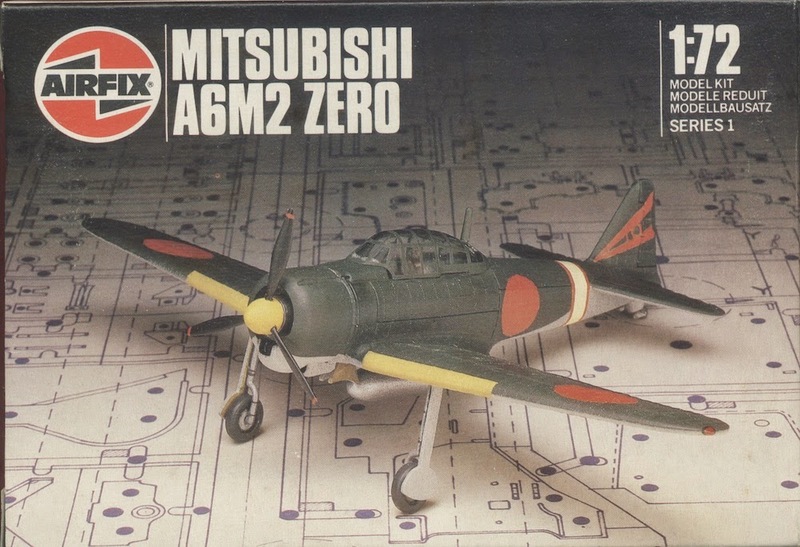 As with previous Zero kits the box art and painting instructions omitted the blue-black cowling. 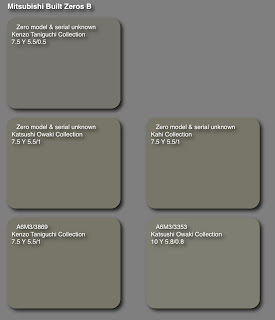 An upper surface colour of 'grey-green' was suggested in the instructions but no colour was suggested for the undersurfaces, presumably expecting the modeller to make do with the kit plastic! Examples of this kit have been encountered moulded in various shades of sky blue, sky, duck egg green and eau-de-nil with later editions typically moulded in light grey. 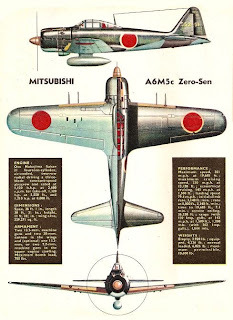 The simple decal sheet consisted of Hinomaru, with white borders on upper wings and fuselage, and a white tail code for one aircraft ヨ-114 (the katakana character ヨ = 'Yo' for the Yokosuka Kokutai). 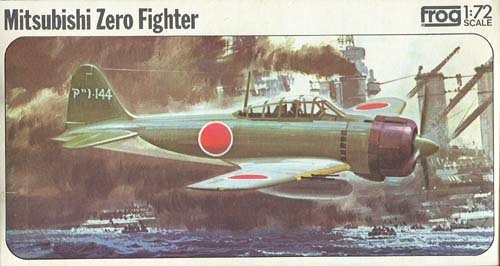 The later Hawk model (which we shall also be taking a look at) was depicted as a unit stablemate, being ヨ-110. When comic book artist Ian Kennedy prepared his excellent artwork for Fleetway Library's Air Ace Picture Library #250 "Rocket Bomb Revenge" in July 1965, he also depicted an aircraft from this unit ヨ-117 (below). 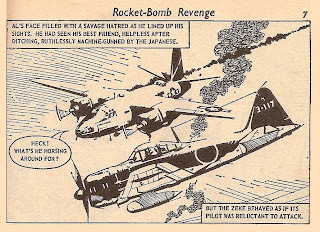 "Rocket Bomb Revenge" told the fabulous story of a mixed race spy masquerading as a Zero pilot and how his path crossed several times with a US B-26 Marauder crew. Ultimately he hi-jacks an 'Ohka' rocket-propelled suicide bomb, "switching off the fuses" and landing it intact on the deck of a USN aircraft carrier! 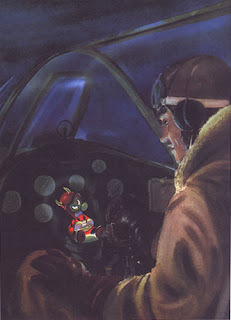 The far-fetched storyline was ultimately rescued by the skilled pen work of Mr Kennedy and his appreciation for the actual shape and form of aircraft. Those editions of the Air Ace Picture Library which he drew are now eagerly sought after collectables. Note the economy of line in his work and the way he uses blank space to suggest high reflection off the aircraft canopy glazing. "Rocket Bomb Revenge" was also unusual in featuring an attack by Kawasaki Ki-102 'Randy' heavy fighters, a Japanese Army type unknown to most schoolboys at that time. The storyline even mentions their 57mm nose cannon! 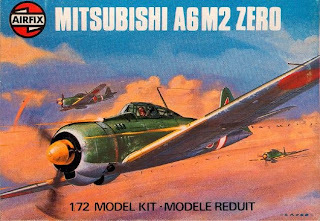 In 1969 Revell's Zero was also issued together with the Grumman Wildcat in the 'Fighting Deuces' series as Kit # H-220 (above). It survived until the 1990's when it was last re-issued with new box art (below) and revised markings for ツ-46 (from the Tsukuba Ku). 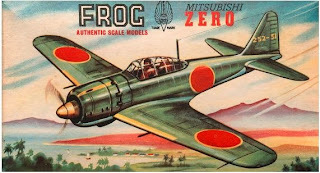 The iconic Frog Zero-Sen model dates from 1959 and survived until at least the 1990's as a Revell re-issue under their acquired Matchbox logo. It was originally intended for discontinuation in 1968 but the mould was cleaned up and "improved" by AMT that same year and the kit soldiered on (although as far as I know it was never issued in the USA under the AMT logo). 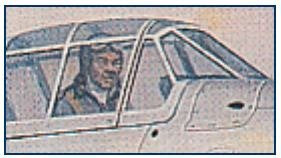 The later re-issues were not as clean as the earlier ones, which had engraved panel line detail and markings positions. 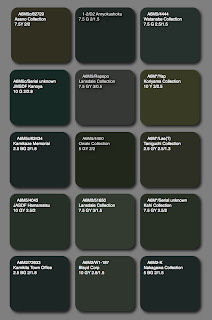 The raised lines and grey "soapy" plastic of the post-AMT revision seem retrograde changes viewed in comparison to a mint duck egg green or sky blue plastic pre-1968 kit. According to Lines and Heelström* 45,000 kits in the original Type D yellow sided box (as shown in the heading image) were issued between 1959 and 1965. The kit was numbered 392F but there is an unconfirmed possibility that some of the later boxes were numbered F392. In 1966 the kit was released as 5903 in the USA (shown above) in their Air Lines range by Frog's distributor Lines Bros Inc. 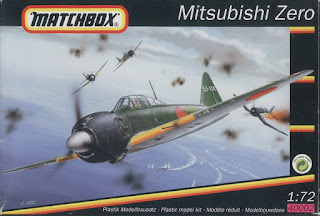 This kit featured new box art by Jo Kotula as shown above. Between 1965 and 1968 100,000 kits numbered F392 were issued in the Type F1 black series box (shown below) featuring the new Jo Kotula box art with a colour profile and plan on the reverse. This was the last issue of the kit in the original crisply moulded duck egg green plastic with engraved national insignia. 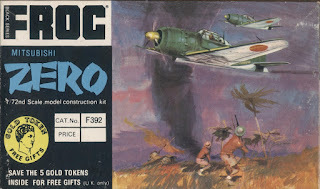 From 1969 to 1974 no fewer than 260,000 kits were re-issued as F219F in a plastic bag ((Type J2) with a cardboard header (as shown below) with new art by Eric Carless (?). This was the re-moulded kit in grey plastic with the engraved insignia positions removed and raised panel line detail. 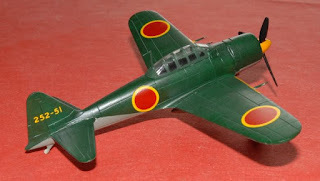 The kit now played fast and loose by offering two markings options with decals for a dark green aircraft of the "Atsugi Kokutai" in Japan, 1944 and a speckled bird of the 251st Kokutai over Bougainville in 1942 without specifying the variant sub-types. The tail code on the Atsugi option seems to represent the Katakana for Ah-Tsu (アツ-144) which is a code that Donald W Thorpe attributed to Atsugi in his 1977 book**. 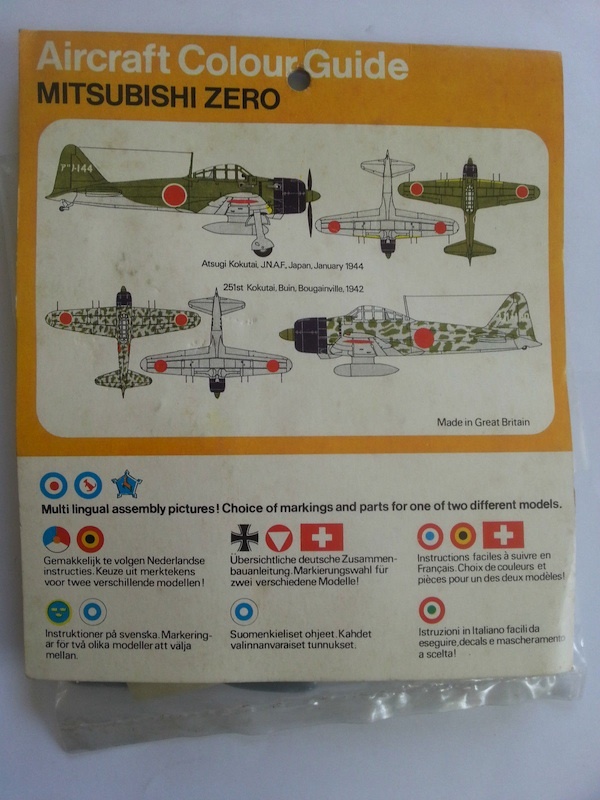 The 251st Ku tail code U1-150 and speckled camouflage scheme suggest an A6M3 Model 22 but the '5' in the code is curiously printed smaller than the other characters. 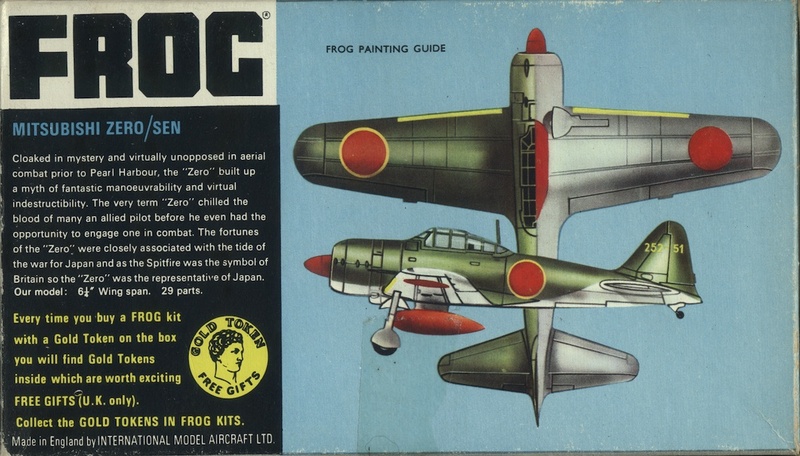 The final Frog issue, as F219 from 1974 to 1977, featured a new white box (below) with the same artwork and 65,000 kits are reported to have been released in both conventional separate lid and tray type H boxes. The very last Frog Zero issues, from 1976 to 1977, were in the company's characteristic twilight blue plastic, representative perhaps of the Soviet clouds already darkening the future of this most British of brands. When those various executives and bean counters devised the "cunning plan" to ship the molds to the USSR, to be paid for by the free production of Novo kits for sale in the UK, it was a heritage offence typical of that era. What Frog had come to represent was not valued and was believed not worth preserving in a national sense. Now of course the original Frog kits increase in value year on year whilst the "Frog spawn" still reappearing under various Russian and East European logos is but a pale imitation of its glorious past. 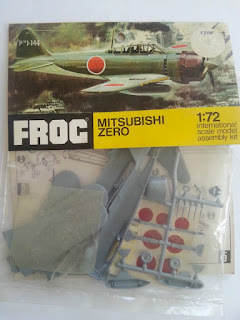 Anyone seeking to judge Frog quality from the 50 year old much-abused retread of the Zero-Sen should examine an original first-issue kit and, preferably, build one! 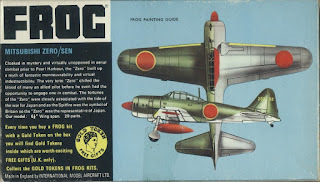 Revell-Matchbox re-issue ~ Frog's hybrid lurks under J Velc's A6M5 artwork! 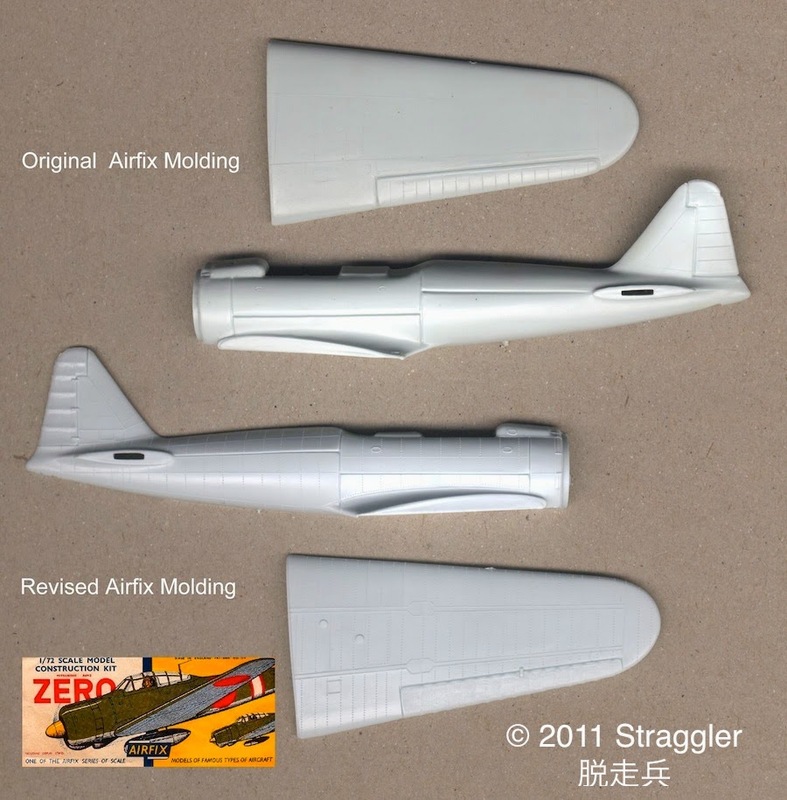 The Zero mould, and its Rufe stablemate, did not make the one way journey into the neglect and convoluted dealings of the Soviet state toy industry, being rejected along with other models of Axis aircraft. 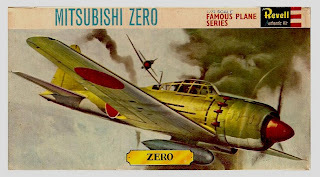 Instead they were acquired by Revell from whose factories they re-appeared in various guises. The Zero was re-issued in 1996 under the Matchbox logo acquired by Revell (as shown above) with a new decal sheet for an A6M5. I often wondered where Frog's original fanciful colour scheme and markings originated. The yellow-bordered hinomaru, those yellow stripes on the nose gun troughs and the absence of a black cowling, the suggestion to paint the undersides "light green or sky". 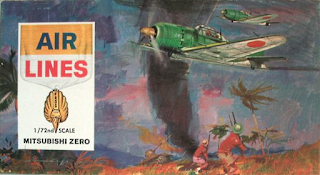 Then I discovered a colour four-view (above) in the December, 1956 edition of RAF Flying Review magazine (Volume 12 No.4) accompanying an article entitled "I Designed the Zero" by Jiro Horikoshi. Frog even used the identical tail number '252-51'! 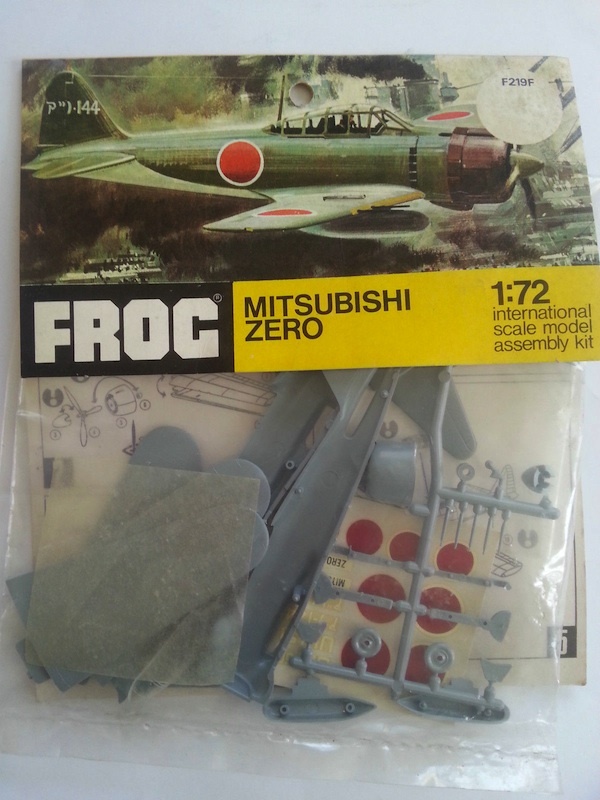 The Frog kit has no interior and no wheel wells, typical of its era. 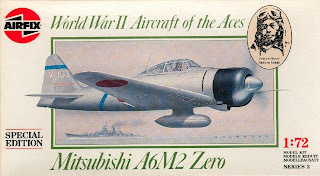 Although intended to represent the A6M5c there were no cowling injector style exhausts and the twin gun barrels in each wing were identical. Nevertheless I loved her then and I still love her now! I can remember the first one I ever encountered being built by a pal on the highly-polished table in his parents dining room (!) and arguing with him about whether the drop tank was meant to represent a bomb. 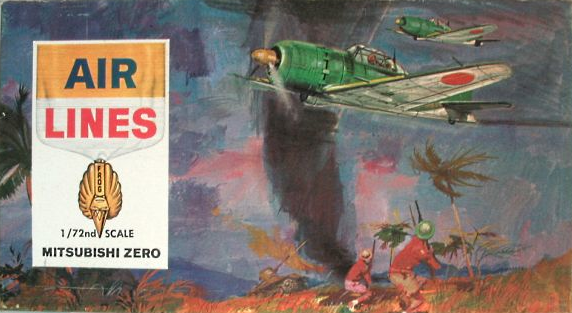 ** Japanese Naval Air Force Camouflage and Markings World War II by Donald W Thorpe, Aero Publishers Inc., 1977. 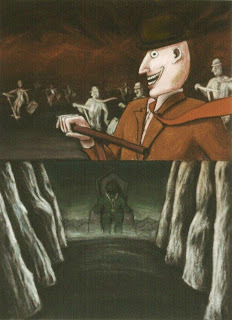 Images credit: Mainly Straggler's collection; some box art from web; Model photograph from web - if it's yours please holler and I'll be pleased to credit it! 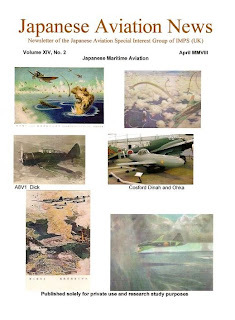 Japanese Aviation News is the newsletter of the Japanese Aviation Special Interest Group of IPMS (UK). The latest issue is 16 pages of colour printed on glossy paper and is full of interesting features and news primarily focussed towards Japanese aircraft modelling. 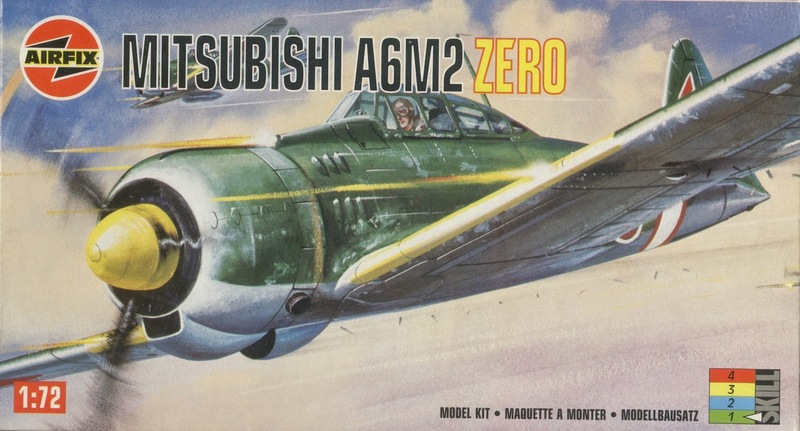 There is a feature on Hasegawa's jet-powered Shiden Kai J7W2 kit, reviews of recent kits, books and decals and a collection of box art from some unusual Zero kits. 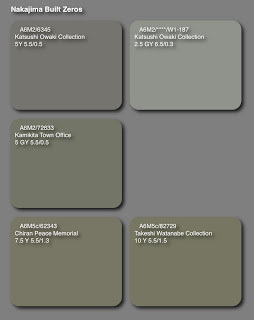 This post has been removed at the request of several persons in Japan. No other comment at this stage. I'm keeping my powder dry. This hypothesis takes the current appearance of the Iida Zero artifacts and projects the effect of reducing the age darkening in stages towards the faded and bleached example of the Niihau artifact. The stages of 25%, 50% and 75% have been calculated. 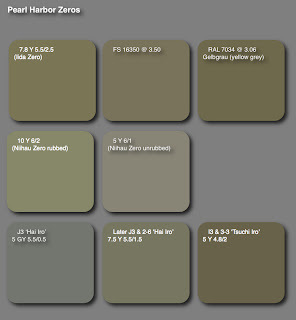 Most interestingly in all cases the closest matches continue as FS 16350 and RAL 7034 Gelbgrau (yellow grey) with the difference calculations shown in parentheses. In the case of 25% reduction the closest Munsell is 7.5 Y 6/2 @ 4.03. In the other two cases the closest Munsell is 10 Y 6/2 @ 2.65 and 1.24 respectively. The Niihau example, assuming a fade of 100% from the Iida example, measures against the J3 and I3 samples as 7.31 and 13.40. In all cases the actual and projected artifact values are closer to the J3 sample by less than half their difference to the I3 sample. 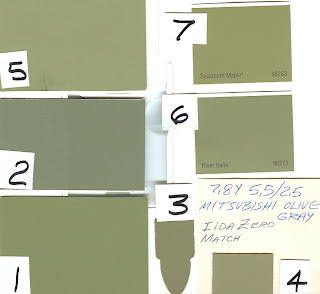 Assuming the values of these two samples are correct, it is improbable that the original paint applied to the Iida and Niihau Zero artifacts matched I3 but more probable that it matched J3. 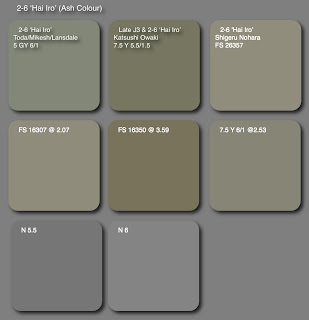 We might reasonably expect the original paint to have been slightly lighter and "greyer" with less yellowing (amber), which in turn will decrease the green caste. 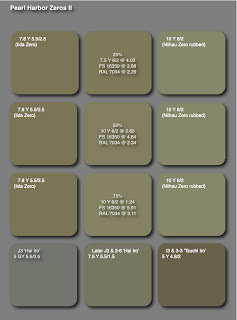 But please bear in mind the contemporaneous description "J3 grey colour (but) slightly towards amber colour", which suggests the original paint was a warm grey with a slightly yellow or amber caste to it.